Dunkin' Donuts has been expanding their breakfast menu for sometime. They've added an array of breakfast menu items that go beyond donuts, and they've expanded their coffee offerings to better compete with Starbucks and the like. The most recent example of Dunkin' Donuts' breakfast menu improvements is the Sausage Supreme Omelet. 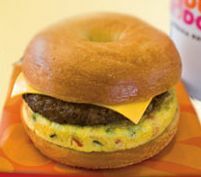 It is eggs scrambles with vegetables, a sausage patty and American cheese on a baked bagel.